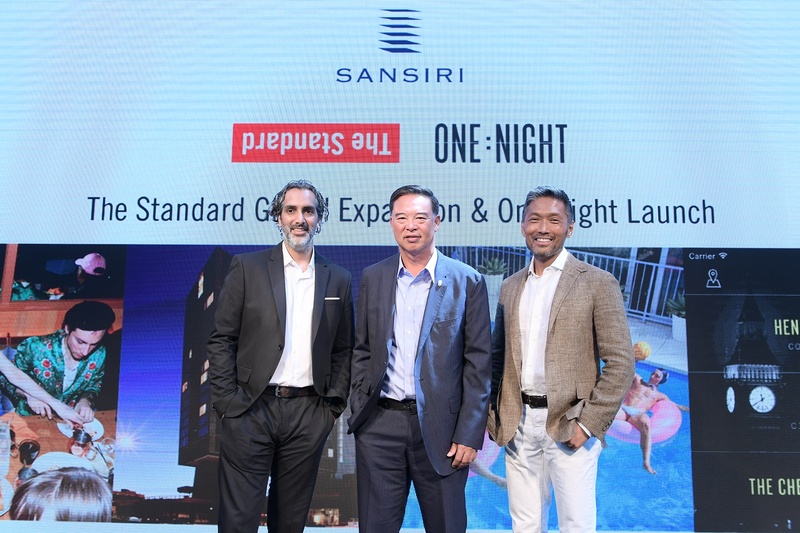 Bangkok – As part of its recent expansion into the global hospitality, technology and lifestyle industries through an investment worth US$80 million in six global brands, Sansiri has announced the arrival in the Thai market of The Standard Hotels and Residences as part of its wider global expansion and Asia’s first launch of the One Night spontaneous hotel booking app in Bangkok. The brands’ move to Asia followed a rapid growth fueled by significant investments from Sansiri last year. Standard International has doubled its secured footprint globally from 5 to 10 hotels within 1 year and plans to double again to 20 within 5 years, while One Night will now expand its reach to the thriving Asian market, starting with Bangkok. The Standard, considered the most powerful brand in the boutique hotel business, doubled its secured global footprint following Sansiri's acquisition of a 35% stake in the parent company for US$58 million. Known for its people and its progressive approach to cultural programming, partnerships and events, The Standard will expand its distinctive voice to new markets, connecting its community focused and social voice globally. Ten properties are slated to open across the world including two in Thailand over the next few years, as part of its five-year plan to develop 20 hotels globally in thriving urban and intriguing resort locations. The plan includes and targets new hotels in London (opening Q1 2019), Paris, Milan, Berlin, Lisbon, Prague, Madrid, Chicago, Las Vegas, New Orleans, Atlanta, Dubai, Singapore, China, Hong Kong, Taiwan, Bangkok, Phuket, Hua Hin, Jakarta and Bali. The Standard has secured or are now in advanced discussions in all of the markets mentioned. With its existing portfolio of six properties and a combined 1,200 rooms (including the soon to open London property), The Standard generates annual property level revenue of approximately US$200 million, with an average occupancy rate of 85%, and 121% revenue per available room (RevPar) relative to its comparable set of hotels. Standard also has a very high percentage of direct bookings and repeat guests which are further indicators of the brand’s strength relative to its competitors. One Night will launch in Bangkok with 16 of the best independent hotels: Akyra TAS Sukhumvit, Akyra Thonglor, Ba Hao, The Cabochon Hotel, The Okura Prestige, Riva Arun, Riva Surya, Shanghai Mansion, The Siam Hotel, Siam@Siam Design Hotel, The Sukhothai, The Sukosol, 137 Pillars Suites & Residences, Amdaeng Hotel, Josh Hotel, and Oneday Hostel. To celebrate the launch of One Night in Bangkok, members of Sansiri Family and Siri Priority enjoy 1,000 THB and 1,500 THB discount off hotel booking at One Night in Bangkok respectively, valid today until 30 November 2018. In addition to Bangkok, One Night is operating in 15 major cities in the United States and London with over 170 independent hotels. One Night is projected to be in 30 cities by year-end 2019, including more cities in Asia and Europe. “The strategic partnerships with such strong and exciting brands will strengthen Sansiri’s core real estate business. Consumers will also benefit from having access to services provided by truly world-class leaders. The arrival of both The Standard and One Night in the Thai market marks another important step to be followed by several more in the future,” concluded Chutrakul.